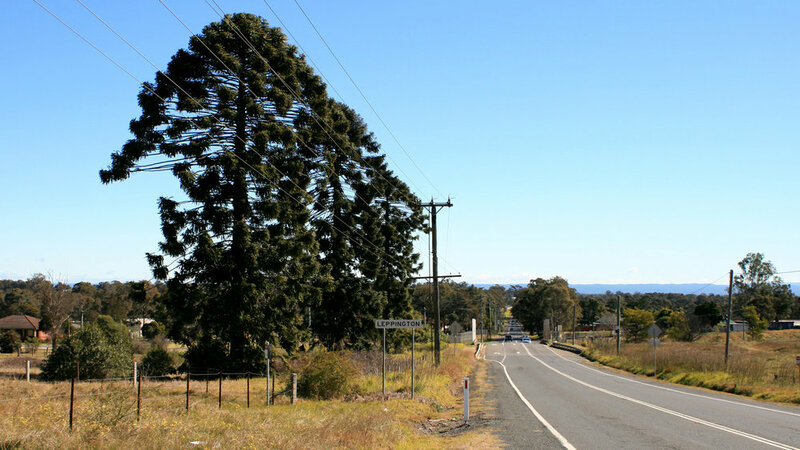 Bringelly Road runs for approximately 10 km between the Camden Valley Way and The Northern Road and forms a key component of the RMS transport strategy for the South West Growth Centre. The proposed road upgrade will cater for the projected increase in traffic volumes associated with the urban development. The semi-rural landscape character of the road corridor incorporates extensive remnant Cumberland Plain Woodland vegetation that offers an opportunity for incorporation into the landscape concept for the road upgrade. The gently undulating landform combined with a number of creek crossings provides an attractive visual sequence for motorists, which the urban and landscape design seeks to enhance. 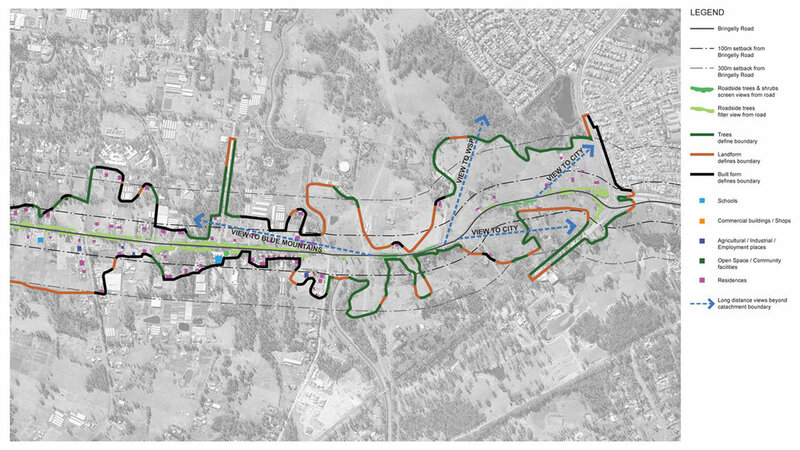 Corkery Consulting was engaged to prepare a visual assessment for the Bringelly Road corridor as input to the urban and landscape design component of the project. The visual assessment was carried out in accordance with the RMS Guidelines and the results presented in a Visual Impact Assessment Report. The visual catchment of Bringelly Road was mapped and analysed to determine those residences and work places that have views of the road. The road corridor was then divided in to 11 Landscape Character Zones that reflected a distinct combination of landform, vegetation and land uses. Each Character Zone was described and illustrated with annotated photgraphs. The potential impact of the proposed road upgrade on the landscape character of each Zone was then assessed. Viewpoints within the visual catchment were then mapped and categorized. The potential visual impact of the proposed road upgrade works on each of the viewpoints was assessed by the combination of visual sensitivity of the viewer and the magnitude of the visible works. Mitigation measures were identified that would minimize the potential visual impact of the proposed road works. A series of urban design scenarios were prepared by HBO+EMTB with input from Corkery Consulting to guide planning and design along the interface of the upgraded road with future urban development as well as open space corridors associated with a series of major creeks. Particular focus was placed on opportunities and challenges presented by future urban development adjoining the road corridor, particularly Leppington Town Centre. Panoramic views from the ridgeline that forms part of Western Sydney Parklands are to be retained and enhanced by careful design of the road works and associated landscape treatment. 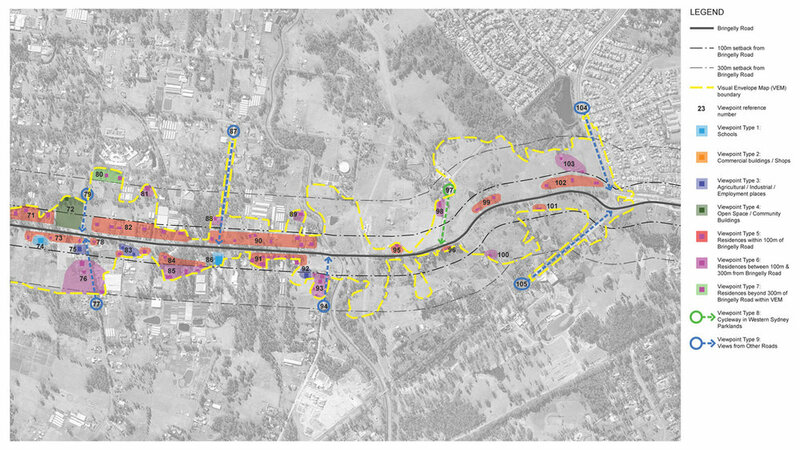 Pedestrian and cycle connections along and across the road corridor were carefully considered, including the opportunity for access to the section of Western Sydney Parklands at the eastern end of Bringelly Road.